Valentines Days Gift Ideas: For a loved one or as a wish for a special couple. Special wedding, anniversary or engagement gift. Asian Art & Home Decor, Nancy Gong's Art Glass Blessings; 5" dia. 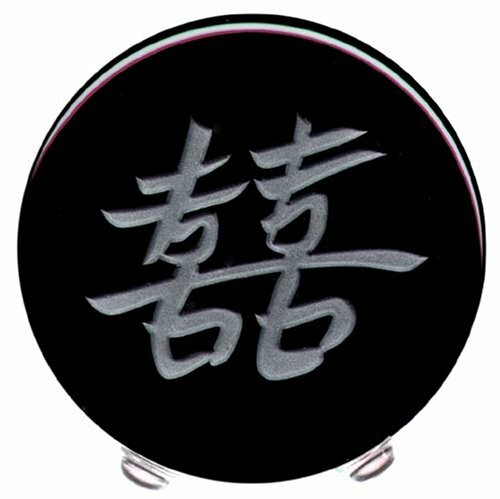 Hand Cast, Hand Carved Black Opal Glass, Calligraphy translates to "Double Joy; Double Happiness", a wish for Couples, Husband / Wife, Parent, Valentine, Wedding or Anniversary gift. Freestanding table, desk top or self display. Sure to be a sentimental feng shui gift. Also Available in Deep Amethyst, Sapphire Blue, Emerald Green, Kiwi Green, Yellow and Bronze. Contact Seller. For a loved one or as a wish for a special couple. Special wedding, anniversary or engagement gift. Asian Art & Home Decor, Nancy Gong's Art Glass Blessings; 5" dia. Hand Cast, Hand Carved Black Opal Glass, Calligraphy translates to "Double Joy; Double Happiness", a wish for Couples, Husband / Wife, Parent, Valentine, Wedding or Anniversary gift. Freestanding table, desk top or self display. Sure to be a sentimental feng shui gift. Also Available in Deep Amethyst, Sapphire Blue, Emerald Green, Kiwi Green, Yellow and Bronze. Contact Seller. This Art Glass Blessing was designed and created by glass artist Nancy Gong. The Oriental design celebrates the Chinese culture. The calligraphic design - a Chinese way of thinking, comes from the tradition of hanging hollow brass Chinese characters in the home or business to remind people of the good things in life. This calligraphic design is a traditional Chinese blessing for couples that wishes them joy and happiness in their life together. A sentimental and personal Valentine, Wedding or Anniversary gift that the recipients, him or her are sure to treasure for years to come. Express your love, or your wishes with this hand etched and carved sentimental blessing, sure to be treasured. Each blessing comes with a descriptive tag and clear plastic feet, is freestanding. Traditional Chinese blessing for couples...a wish your favorite couple or your love, a lifetime of happiness together! A unique, handcrafted treasure! Simple, elegant and to the point.